SPARKS, Nev. --- Sierra Nevada Corporation's (SNC) Dream Chaser spacecraft will be on display for the first time, available for attendees of the 34th annual Space Symposium conference in Colorado Springs, Colorado to see the vehicle up-close. "The Dream Chaser spacecraft is going to bring new capabilities to low-Earth orbit, and SNC is thrilled to have a venue for people to see firsthand what a remarkable piece of engineering it is," said Eren Ozmen, president and co-owner of SNC. "SNC is proud to bring a runway-landing vehicle back to the space landscape." Under contract with NASA, the Dream Chaser - known as "America's spaceplane" - will perform cargo resupply and return services for the International Space Station starting in late 2020 under the Commercial Resupply Services 2 (CRS2) contract. The multi-mission, reusable vehicle is the only commercial, lifting-body spacecraft capable of a gentle, runway landing. Featured at this year's Space Symposium Summit Circle, the Dream Chaser vehicle on display conducted a successful atmospheric Free-Flight test last November at Edwards Air Force Base California, with the support of NASA's Armstrong Flight Research Facility. The test fully demonstrated its in-flight and landing capabilities for future low-Earth orbit missions. "We've been waiting a long time to be able to show-off the capabilities of the Dream Chaser and we can't think of a better venue than the Space Symposium - full of space enthusiasts who will appreciate the vehicle's engineering and design elements," said Mark Sirangelo, executive vice president of SNC's Space Systems business area. Attendees will see the 30-foot long vehicle, learn more about its capabilities and have an opportunity take a photo with the spacecraft. The symposium, the largest yearly gathering of domestic and international space industry professionals, will take place at the Broadmoor Hotel in Colorado Springs from April 16-April 19. The Dream Chaser vehicle display is only available to Space Symposium credentialed media and conference attendees. There will be a press conference on Wednesday, April 19 at 9:00am at Summit Circle. Media Advisory to follow. 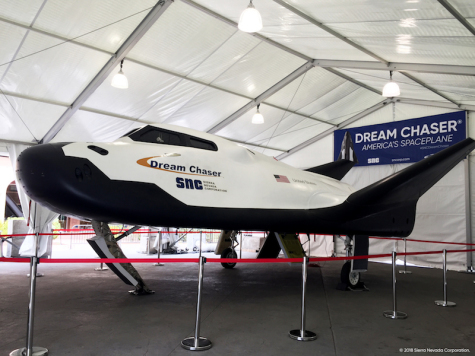 Owned and operated by SNC, the Dream Chaser spacecraft is a reusable, multi-mission space utility vehicle. It is capable of transportation services to and from low-Earth orbit, where the International Space Station resides, and is the only commercial, lifting-body vehicle capable of a runway landing. The Dream Chaser Cargo System was selected by NASA to provide cargo delivery and disposal services to the space station under the Commercial Resupply Services 2 (CRS2) contract. All Dream Chaser CRS2 cargo missions are planned to land at Kennedy Space Center's Shuttle Landing Facility. Sierra Nevada Corporation (SNC) is a leader in solving the toughest challenges through advanced engineering technologies in Space Systems, Commercial Solutions, and National Security and Defense. SNC's Space Systems business area designs and manufactures advanced spacecraft and satellite solutions, space habitats and environmental systems, propulsion systems, precision space mechanisms and subsystems, and the Dream Chaser spacecraft.